Time has faded this little carte-des-visite, but it’s such a remarkable image that I had to add it to my collection. 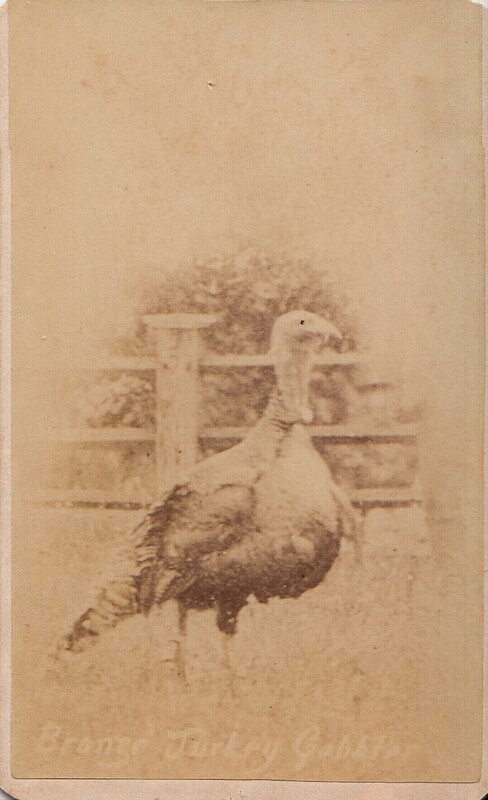 The inscription on the front (written on the negative before printing) is “bronze turkey gobbler.” Yes, someone touched up the eye with a dot of ink, a practice that I often see in faded albumen prints like this one. According to the Livestock Conservancy, the bronze turkey breed developed from crosses between turkeys transported to America by colonists and our indigenous wild turkeys. This fellow has a big breast, but his stance reminds me of the wild turkeys I sometimes see strolling along the wooded edge of cornfields in the fall. He was photographed outdoors, standing in front of a fence, which is unusual for cdvs. Of course, bringing a turkey into a photographer’s studio would have been a mighty task! What makes this picture especially interesting, however, is the text on the back. Someone wrote the following: “Look at me through a magnifying glass if you want to see me as natural as Life.” The message suggests that the original photograph showed a level of detail that someone found remarkable. The phrase “natural as Life” shows up in conversations about photography at the time, and it suggests that the image was considered to be especially faithful. 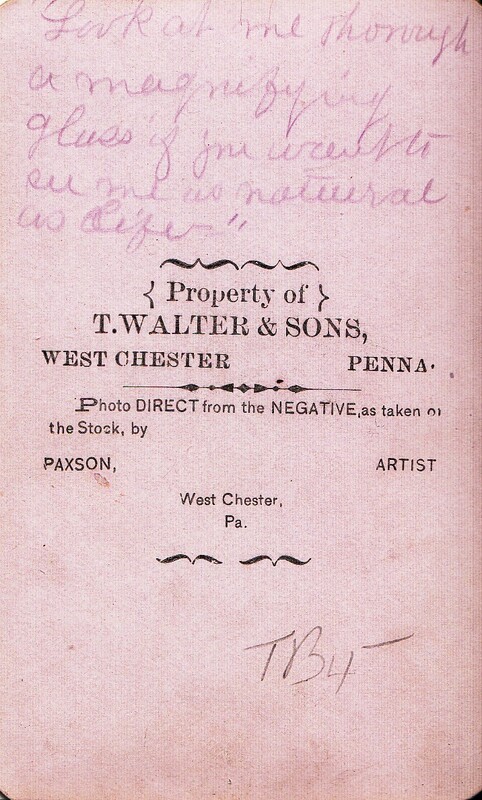 Below the text is the statement that the photograph is the “Property of T. Walter & Sons, West Chester Penna” along with the note that the image was taken “DIRECT from the NEGATIVE” by “PAXSON ARTIST,” also of West Chester. Who were the Walters? A little research shows that “T. Walter & Sons” was probably Townsend Walter and his sons Townsend and Charles. Townsend Walter, born 1815, was a member of a large extended Quaker family in Chester County. “T. Walter & Sons” shows up in the West Chester city directory of 1879 among the farmers who “took their mail” in town. Members of the Walters clan, including one of the two Townsends, were founders of chapters of the Patrons of Husbandry (the Grange) in 1873. The Walters were known for their prize-winning “Chester White” pigs, a breed that actually was developed in Chester County, Pennsylvania. I can’t find any information on the Walters’ turkey-husbandry activities. However, the fact that their name is on the card suggests to me that it was used as an advertising trade card. There were several photographers with the surname “Paxson” working in West Chester starting in 1876 and working through the 1880s, so the best guess for this cdv is around 1880, late for the portrait format but just the right size for a trade card. That the Walter family farmed under the name of “T. Walter & Sons” suggests their orientation toward commerce. So this “Bronze Turkey Gobbler” had his portrait made to advertise the family’s agricultural business. I surmise that they raised high quality animals for meat. Mr. Gobbler may have made someone an impressive holiday feast, or he may have been prized as breeding stock and spared a premature end. In either event, his portrait is an interesting rarity. I mean, how many Victorian turkey portraits have you seen? Are you sure about this? I’m looking for information about a photographer that was present in the spanish-american war and traveled to Puerto Rico (and maybe Cuba and the Philippines) in 1898. His name is Walter B. Townsend. He is accredited for the photographs in “Our Islands and their people as seen with camera and pencil”. In my research I found that his name is in a list called “Photographers in The New York Public Library’s Photography Collection” (http://www.nypl.org/sites/default/files/Photographers_in_The_New_York_Public_Library_April_16_2010.pdf). But I can not find any other biographic information of him, unless your turkey portrait is his. Townsend Walter is the name of the farmer whose name is on the back of the image as T. Walter & Sons. I know it sounds backwards, but the family name was Walter. The photographer’s name is Paxson, and he worked in West Chester, PA. Thanks for asking, however.